Six people are diagnosed with motor neurone disease every day in the UK. This rapidly progressing disease can kill fast; more than half of people die within two years of diagnosis. We were appointed by the MND Association to help devise and deliver a major campaign for MND Awareness Month to increase understanding of this fatal disease and invite people to support the charity in writing the next chapter. The campaign focused on a number of powerful Shortened Stories – real people whose lives have or would be cut short by MND. The stories inspired artists to capture and share them through eye-gaze painting, poetry, film and photography, on a dedicated website. 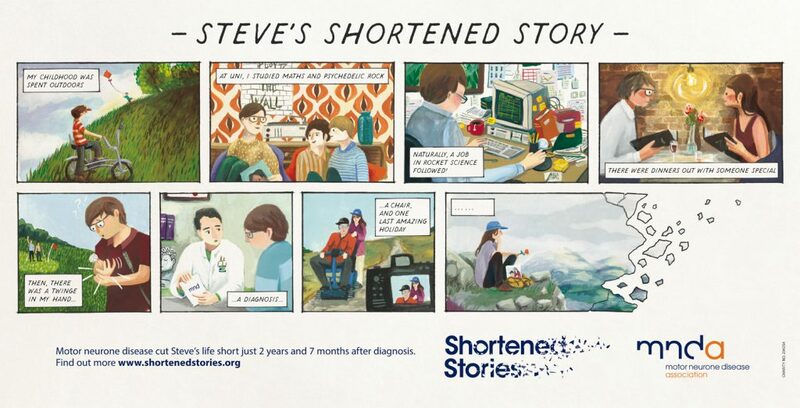 Steve’s story appeared on over 2,500 posters across the National Rail and bus network, and on the London Underground, and captured the imagination of the public who shared the campaign and poster sightings on social media. A national news story about long delays in diagnosis and interviews with charity spokespeople and people living with MND kicked off MND Awareness Month with significant levels of media coverage. Working closely with the in-house team, we delivered over 500 pieces of coverage with a reach of over 29 million in titles including the Sun, Express Online, Mail Online, BBC Online and the Sunday Mirror. The story also ran on Radio 4’s Today programme, BBC Breakfast, Radio 5 Live, Radio 2, Lorraine and Good Morning Sunday with Clare Balding. There was a significant increase in traffic to the MND Association website from day one of the campaign and celebrity support from Zoe Ball, Eddie Redmayne and Benedict Cumberbatch kept momentum going throughout the month.